As she aged, my great aunt wrote herself notes about all the things in her house. Making these labels for the ghost keys made me think of her labelling everything: keys, dishes, silverware, portraits, lamps and chairs – identifying the important things in her house, the house and all the things in it inherited from her parents, so her nieces and nephews could begin to understand the depth of the history that wrapped around her. 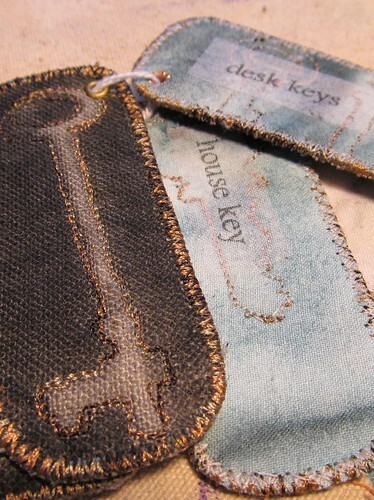 These keys are sunprinted on a natural linen, and embroidered around the edges. Organza printed labels on the back identify what the keys might be for. 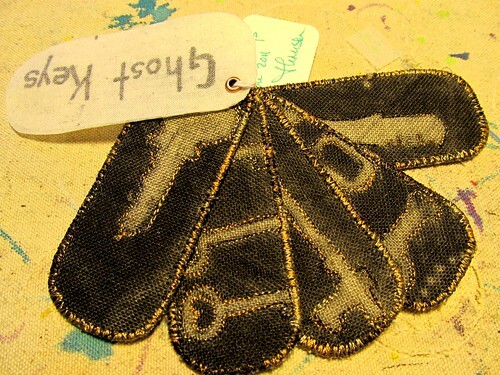 Small grommets in a corner of each tag allow them to be threaded onto a string with another label. I put these up for sale on Etsy.